Low carb peanut butter powder with just 2.3 net carbs per 2 Tablespoons. Tastes delicious! 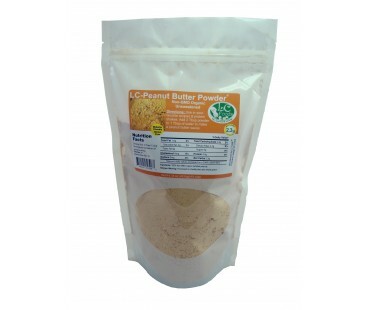 Enjoy this 100% Non-GMO organic peanut butter powder, made with defatted peanuts and no added salt. Great for making your favorite smoothie and in your favorite recipes. Add coconut oil and water to whip up the world's healthiest peanut butter. Great for making peanut sauces of all kinds. Need some other ideas? Add some to our low carb pancake mix and top with low carb syrup or maybe a peanut butter sauce? As with all LC Foods low carb products, there's no sugar added (of course) and no preservatives! This peanut butter powder is AMAZING! I originally bought it for a recipe, which turned out great, but also add it to my protein shakes. Your story is inspiring. Thank you for your service! This peanut powder is good, I put it in some vanilla yogurt with some of your dark chocolate chip. It made my day, first real treat in 3 1/2 months. Blood sugar is great. Thank you!